Shore Blinds and Shutters Provides Consultation, Window Measuring and Professional Installation for Window Treatments from Little River to Georgetown, SC. Gone are the days of running all over town to shop for window coverings. 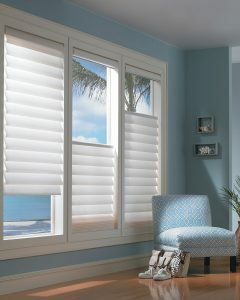 Shore Blinds and Shutters will come to you. Consultations are done by appointment only, in the privacy of your home or business. So why pay retail and storefront pricing when we can bring the showroom to you? We prefer to pass along the savings to our clients. Every window is different and the best way to purchase a window covering is to work with experience professionals who will provide decorative options, look at your windows, measure them correctly and install your window coverings to fit like a glove. Utilizing our “Expert” experience we will help you through the design process taking the guesswork out of making your choice. Call us and give us an idea what you might be interested in. Set an appointment time that works with your busy schedule. We will visit your home with our large variety of window covering samples. We will help you through the decision process based on your needs and budget. Your windows will be professionally measured (at no cost to you). A written estimate will be submitted. Your window coverings will be ordered and manufactured. An installation appointment will be set up. Your window treatments will be installed to your specifications.